I’m off! The last time I drove through Colorado to Nebraska this time of year, I crossed paths with a flock of Sandhill Cranes on their spring migration North. 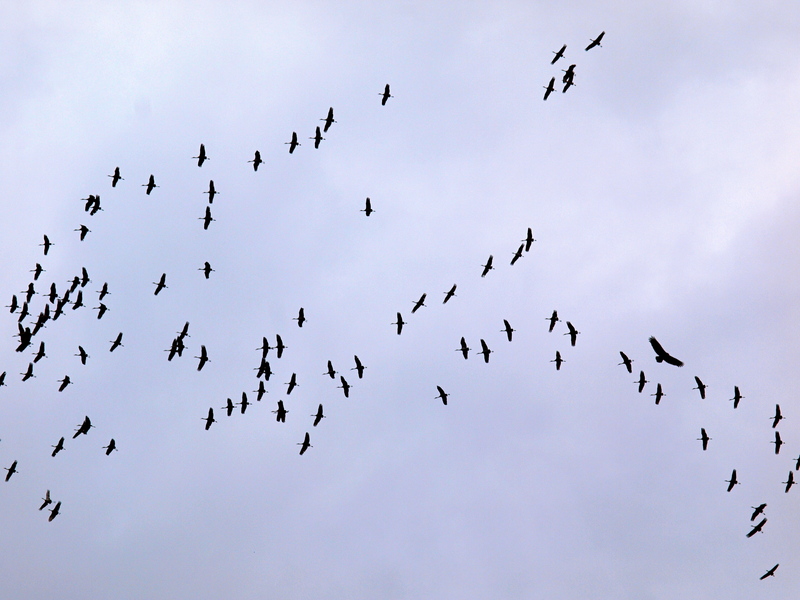 The cranes weren’t flying in a familiar V-formation; they were scattered, bunched, panicked, by an eagle hunting in their midst. I pulled over and snapped this photo, one of my all time favorite shots of Wild America. Stay tuned for posts on Carhenge, Cather Country, and the Pony Express as I make my Teardrop dreams come true! This entry was posted in Photography, Road tripping!. Bookmark the permalink. 5 Responses to On the Road, Again: Nebraska! Wow, the photo show just how large a golden eagle is! This is a good shot, Mary. Thanks! I once saw a Golden Eagle sitting on a fencepost in Wyoming and it was massive! Sometimes it’s hard to tell how big they really are when they’re up in the sky. Sandhill Cranes are pretty big birds in their own right and that eagle makes them look like sparrows. Since I am in Nebraska, this will be interesting to see what you come across! I’ve seen the Sandhilll Cranes fly over and land in an open field. Couldn’t get close enough for a decent shot as the spooked and flew off. I love their “trilling” sound as they fly overhead. What a terrific photo – not just that you captured a rare sight, but the arrangement of the cranes in the sky would make this an interesting shot even if the birds were of a kind commonly seen.